President Reuven Rivlin met today (Tuesday) with Spanish Prime Minister Mariano Rajuez at the Prime Minister's palace in Madrid. Rajuez has been Prime Minister of Spain since December, 2011 and President of the People's Party since 2004. The meeting was also attended by Minister Gila Gamliel, who accompanied the President's entourage. "The secret of our relationship rests on a strong bond not only between states, but also between peoples," the President said. "The historical family roots of many Israelis are to be found here." The President expressed his condolences for the terror that struck Spain last August, adding that the entire free world must join forces to ensure the eradication of terrorism: "Terrorism and religious extremism are a global and tangible threat that affect us all. Unfortunately, we have experience in the field and are willing to contribute by all means available to us in order to combat this phenomenon." The President spoke to the Prime Minister about the government's stance against the boycott campaign, saying that the campaign was "tainted by anti-Semitic elements." He also asked the Prime Minister to promote legislation in order to prevent similar steps in the future. "BDS must stop," the President continued. "It is permitted to protest but it's forbidden to cross the line into boycotts." 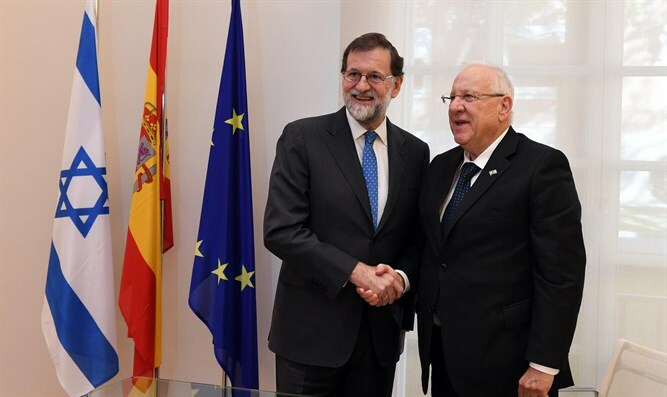 In this context, President Rivlin said that that Israel would be pleased to see Spain change its voting pattern in international forums in a way that would reflect the good bilateral relations between the two countries. "There are decisions taken in international forums that constitute a violation of integrity and intelligent thought." "I want to remind you," said the President, "that the King of Spain is also called the King of Jerusalem and to be a part of UNESCO and say that there is no connection between Jerusalem and the Jewish people is not only ignorance, it is an affront to intellectual integrity. I therefore ask you to make sure that you are not taking part in decisions that result from irrelevant political struggles." The President and the Prime Minister discussed at length the regional situation in the Middle East. The President stressed that Iran is a subversive element leading to the establishment of a Shiite axis in Syria and the entire Middle East, in an attempt to exploit the crises in the region. "The State of Israel closely follows the growing Iranian presence in Syria and operates according to the clear red lines that we have defined." On this issue, the President stressed, "The terror that Iran exports is a threat to the entire world," and explained that the Iranian hold on Yemen with the Houtis and through them could lead to damage to international trade routes, which could be very damaging to Europe as well. As for the nuclear deal, the President told the Prime Minister that Israel and the Western world can not allow a country like Iran that supports terror and calls on the UN to destroy Israel to have nuclear capabilities and stressed to the Spanish Prime Minister: "We must work together to prevent this at all costs. The current agreement does not benefit either Israel or Europe, and even endangers the security and stability of the region," the President said, adding personally to the Spanish Prime Minister that if the agreement does not change: "We must ensure strict adherence to all parts of the agreement and even try to improve it, alongside plans for the day after its expiration."